An interesting story on NPR (one of the most emailed stories for February), about how play has changed in recent history, and the affect that those changes have had. Beloved wife and I have been discussing the quality of play and the impact of “glowing screens”, (e.g., DS Lite, GameCube, Computer, DVDs). 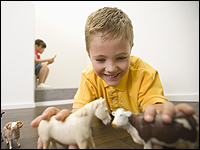 This entry was posted in Family, Fun, Gaming, Health, Learning, Life on February 25, 2008 by Geoff.